Lincoln City manager Danny Cowley believes his side will be looking to match the standards they set midweek against Mansfield Town when they face Chesterfield on Saturday. The Imps grabbed a point in Tuesday night’s 1-1 draw with Stags at the One Call Stadium, which came off the back of two defeats to Crewe and Crawley towards the end of February. And, though he anticipates a different type of challenge when his side visit the Proact Stadium, there is an expectation the players will perform at the same level. 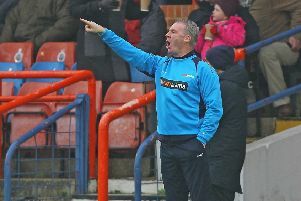 Cowley said: “I expect it to be a really tough game. Jack Lester’s a man I know well. He’s a good football man who has got lots of positive experiences as a player and now as a manager. “I know he’s well thought of at Chesterfield. He’s moved the team around a lot, he’s made a lot of changes to personel so they’ll be very different to when we played them in his first game in charge. “You can see he’s starting to put his stamp on them as a team. They’re going to be fighting for their life. They’re a massive club and the fact they’re contemplating relegation is beyond reality really. “We know how tough the game is going to be. They had a really good result last time out beating Swindon. We had a good look at that game both yesterday and this morning as well as their other games. “They’re going to be a threat and we need to find that same standard. That standard which we set on Tuesday night with our intensity and our energy is so important to us now. Cowley will be without skipper Luke Waterfall who will sit out the first of a three-match ban he received for a red card in Tuesday’s draw with Mansfield.